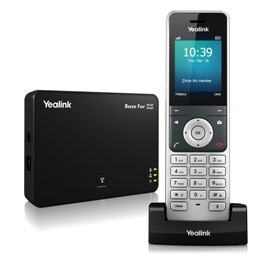 The Yealink W56P is a high-end DECT phone that has an attractive 2.4" 240x320 pixel color screen in addition to having a battery that can handle around 30 hours of talk time and up to 400 hours of standby time. This is a comprehensive review of the Yealink W56P and W56H DECT phone packages and includes our overall review, technical specifications and links to additional documentation along with setup and configuration guides. Out of the box the first impressions of this device are extremely positive. It is a very sleek and attractive handset with a large screen and is comfortable to hold. First impressions are also good when the phone is powered up and you are presented with the very easy to view color display. The phone menus are very intuitive and easy to use which is somewhat unusual for a DECT handset. It was a breeze to put the phone on hold, transfer a call or even conference in a 3rd party. Long lasting battery that provides up to 30 hours of talk time and 400 hours of standby time. Indoor range is 20 to 50m while the outdoor range is 300m. This range can be increased with the use of up to 6 repeaters. Quick charge feature gets you 2 hours of talk time after just 10 minutes of charging time. Base station can handle up to 4 simultaneous calls and 5 lines and is expandable to a total of 5 handsets per base station. Note that there is a maximum of 2 simultaneous calls per handset. Features an industry standard 3.5mm headset jack as opposed to the non-standard 2.5mmm jack that was used on its predecessor the W52P. 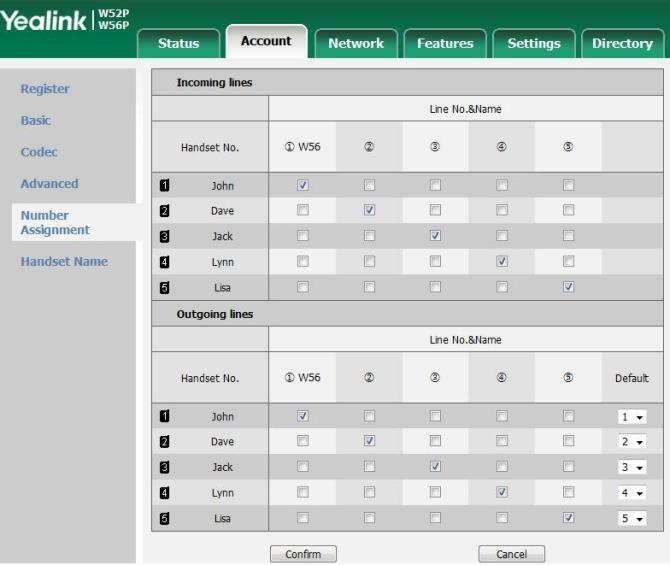 Takes advantage of the standard Yealink user interface which makes it easy to provision and upgrade. Everything you need to use the phone comes in the box and you don't need to purchase any separate power supplies. PoE (Power over Ethernet) is also supported in the event you prefer to use that feature instead of a power supply. The handset charging station (or dock) is powered by USB. Yealink does supply a USB power adapter that you can use to connect to a power socket but since this is USB you can also power it from any USB port. The model numbering is a little confusing as the phone is referred to as W56P and W56H. In reality these are two different packages with the W56P package including the base station (which in this case is a W52P) while the W56H package allows for additional handsets to be used that will sync to the main base station. The more simple explantion is that Yealink intended for the base station to be the W56P while the handsets are W56H. While the speakerphone is nothing short of amazing for a DECT phone, it was a little dissapointing that the phone could not stand up on a desk unless it was sitting in its charging dock. As such it had to be put on its back when using the speakerphone while away from the dock. This did not appear to noticeably effect the audio (the speaker is on the back) however. Using the voicemail hardkey button was a little confusing at first as when these keys are selected on other phones, you are immediately connected to the voicemail attendant. On this phone you are presented with a messages and calls menu from which you then need to select which line you want to access voicemail on. This is perhaps logical and useful if you have multiple lines and multiple voicemail boxes associated with a single device. Elegant DECT phone that charges quickly and would be a good choice for any user that needs to be somewhat mobile while on a call. The larger buttons, color screen and powerful battery have addressed the most common complaints made about it's predecessor the W52P DECT phone (also know as the W52H handset). Outstanding voice clarity with or without speakerphone. Very easy to use and intuitive phone menus. Very impressive DECT phone that is a great alternative to the traditional hard wired desktop IP Phones. These are reasonably priced phones and are a perfect choice for any office locations that have limited access to Ethernet network ports, in addition to being a good choice for folks that simply like to walk and talk. W56P Package consisting of one base unit W52P and one W56H DECT phone. USB Charging station. This is the dock for the handset when not in use. 2 Power adapters, one of which has a USB port for the handset dock. The setup and installation similar to other Yealink devices and did not present any issues. After powering on the base station and the handset, the first thing you need to do is check that the handset is registered to the base station. The phone tested did this out of the box which was nice but we went through the process anyway to check it out. Press and hold the button on top of the base station until the green LED flashes. Now go to the handset and hit the "OK" button and then navigate to "Settings" and then select "7. Registration". The handset will now quickly register with the base station. Assuming your network is already using DHCP the base station should have been assigned an IP address that you can use to access the online user interface. To obtain this IP address, again press the "OK" button, then select "Status" and then "Base". 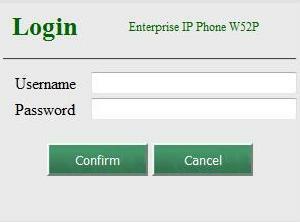 The IP address should be displayed along with other information such as MAC address and firmware version. 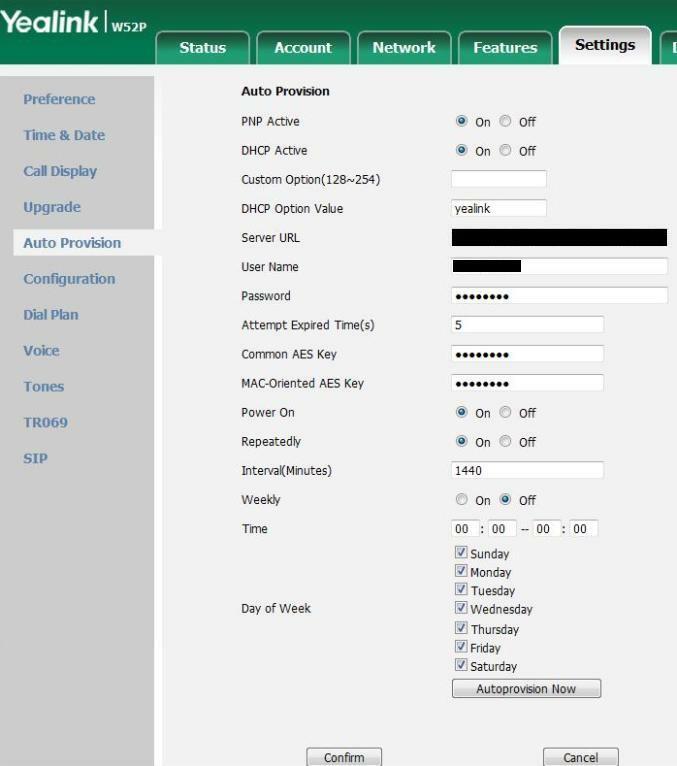 Note that Yealink phones can be typically configured via the actual device, via an online admin portal or via auto-provisioning. The W56P does not allow for configuration from the handset so you will need to use the online admin portal to manually configure the device or auto-provisioning assuming the service provider has already added the relevant configuration to the phone. Continue reading for more details on both of these options. In this case we auto-provisioned the phone from a PBX and it immediately registered and was ready to use within seconds. Server URL - this is the url of your PBX server. Username - this needs to match what is configured on your PBX. Password - also configured on your PBX. Hit "Confirm" and then "Autoprovision Now" and your device should register. Note that if you bought the device directly from your provider, this should all have been done for you and it should just be a matter of powering on the phone to get it registered and working. Label - this is typically what shows up on the phone display but note that it does not appear on the W56P. Display Name - this is the caller name displayed to the internal party you are calling. Register Name - this is typically your extension number but is specified on your PBX or given by your service provider. User Name - again this is typically your extension number. Password - configured on the PBX or given by your service provider. SIPServer1 - configured on the PBX or given by your service provider, e.g. server.providerdomain.com. 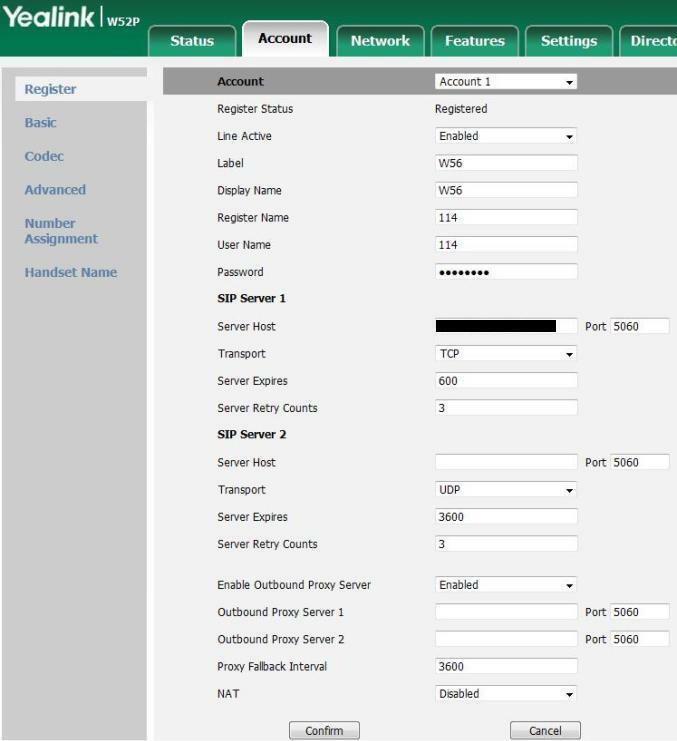 Enable Outbound Proxy Server - enable if required. Outbound Proxy - outbound proxy server address if required. After entering the above information, hit confirm and your device should register and be ready for use. This was accomplished via a quick download from the Yealink site and then going to the "Settings" tab and then selecting the "Upgrade" menu. This worked perfectly for both the handset and the base station. It was mentioned earlier that each base station can support up to 5 handsets. In a typical home enviroment you often have 4 or 5 handsets scattered around your house and they all use the same phone number. The W56H handsets are for business use and as such are much more powerful. One very nice and useful feature worth mentioning is that each handset can have it's own line, or access to shared lines. The above diagram is pretty self explanatory and you simply check the box for each line that you want each handset to have access to for incoming and outgoing calls. Note that each line is configured individually via the aforementioned auto-provisioning process or by manually adding new line information to the "Accounts -> Register" menu. Also worth noting is that it is easy to assign each handset a name which you can see demonstrated in Figure 5. This name shows up on the handset display so you will which phone belongs to which person in your office. The W56P phone package is yet another impressive offering from Yealink and we recommend it as an excellent choice for users that require some level of mobility in the office, or have limited access to Ethernet ports. Please let us know what you think of this device by entering your own review or adding a comment. Use the green "Add Review" button near the top of this page to get started. We're sorry, there are currently no user submitted reviews for Yealink W56P matching your search criteria at this time. Please add your own review or check back later as reviews are being submitted often. Does the Yealink W56P Wireless DECT Phone have speakerphone functionality? -> Response: The W56 Handset(s) do indeed have speaker phone functionality.